When Andy Grove, CEO of Intel, discovered in 1994 that he may have a tumor the size of a cube of sugar growing in his prostate gland he didn’t take the immediate step his doctor suggested. Visit his urologist. Instead he delved into the data, testing the tests to validate his readings, sending blood samples to separate labs to calibrate the degree of lab variations. Only after this did he make an appointment with his urologist. Grove is the co-founder of Intel and the same leader who made Intel’s bold move from memory chips to microprocessors in 1991, advertising “Intel Inside” and the famous three second, five-note jingle in each commercial. Bold and dramatic. Why? At the time Intel could count its direct customers on one hand. 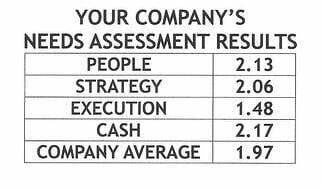 The story is documented in The Greatest Business Decisions of All Tim by Verne Harnish and the Editors of Fortune Magazine. Intel’s share of the microprocessor market is over 80%. Defy the medical establishment. Grove discovered that the medical establishment itself had great uncertainty and disagreement within its own ranks, a dynamic amplified by rapidly advancing technologies. With significant uncertainty multiplied by significant consequences, Grove did what all our 10Xers did, he returned directly to empirical evidence. Andy Grove’s approach to his cancer treatment was unusual, even creative, yet deeply grounded in evidence and rigor. Not to put myself in any proximity to Grove’s scale, however upon reflection I found a kinship with Grove. When I discovered I had Acute Myeloid Leukemia I embarked upon a similar pattern. With the help of my wife, friends, family, clients, and even Verne Harnish’s contributions we researched to discover what the best treatment formula might be. As it turned out the traditional approach to chemotherapy held the most favorable results. Yet with my knowledge and experience through meditation, I felt compelled to not trust the results to the doctors alone. I gave this up to a Higher Source. Fortunately a former client and broadcast provider who I’d continued to have weekly meetings with was eager to begin engaging in meditation as well. Through this discipline and rigor I eventually conquered my cancer bringing it into remission. Through the empathetic, concerned, and best approach philosophy of Physician Assistant, Kevin Heckman, I was able to buck the approach that I couldn’t work during my treatment. Social psychology research indicates that at times of uncertainty, most people look to other people – authority figures, peers, group norms – for their primary cues about how to proceed. 10Xers, in contrast, do not look to conventional wisdom to set their course during times of uncertainty, nor do they primarily look to what other people do, or to what pundits and experts say they should do. They look primarily for empirical evidence. 10Xers don’t attempt to be contrary and independent just for the sake of being contrary and independent. The point is to be more empirical, to buttress mental independence and validate creative instincts. By “empirical” evidence we mean relying upon direct observation, conducting practical experiments, and/or engaging directly with evidence rather than relying upon opinion, whim, conventional wisdom, authority or untested ideas. Empirical evidence enables 10Xers to make bold, creative moves and bound their risk. Andy Grove’s approach to his cancer treatment was unusual, even creative, yet deeply grounded in evidence and rigor. 10Xers didn’t generally make bolder moves than their less successful comparisons; both groups made big bets and, when needed, took dramatic action. Nor did the 10Xers exude more raw confidence than the comparison leaders; indeed, the comparison leaders were often brazenly self-confident. But the 10Xers had a much deeper empirical foundation for their decisions and actions, which gave them well-founded confidence and bounded their risk. As a postscript to this blog it’s interesting to note that Grove and Intel leaders chose their #1 Core Value to be not innovation or creativity but discipline. Grove patterned Intel not after an advanced R&D lab, but McDonalds even keeping a McDonalds hamburger box on his desk with a mock logo, McIntel to remind himself of this. McDonald’s is a business built on systems and routine patterns of discipline. 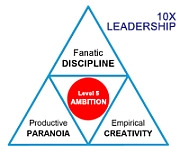 Discipline as Jim Collins notes, “A culture of discipline is not a principle of business; it is a principle of greatness.” The fundamentals of Positioning Systems Strategic Discipline require your business, yourself and your leadership team to undergo a rigorous routine that builds success. Question: Does all this emphasis on being empirical make 10Xer’s indecisive? Grove took action on his cancer once he’d discovered the evidence to support it. 10Xers don’t favor analysis over action they favor empiricism as the foundation for decisive action. Still 10Xer’s, despite their empirical confidence, never feel safe or comfortable; they remain afraid – possibly terrified of what the world can throw at them. They prepare to meet head-on what they most fear. That leads into the third core behavior. Next blog: What exactly is Productive Paranoia?